Most pet owners generally see their pets as part of their family and will go to any length to take care of them. This loving bond is even more evident when there is an emergency situation on ground threatening both animals and humans. The question is, are you prepared to care for your pet in the event of an emergency situation? 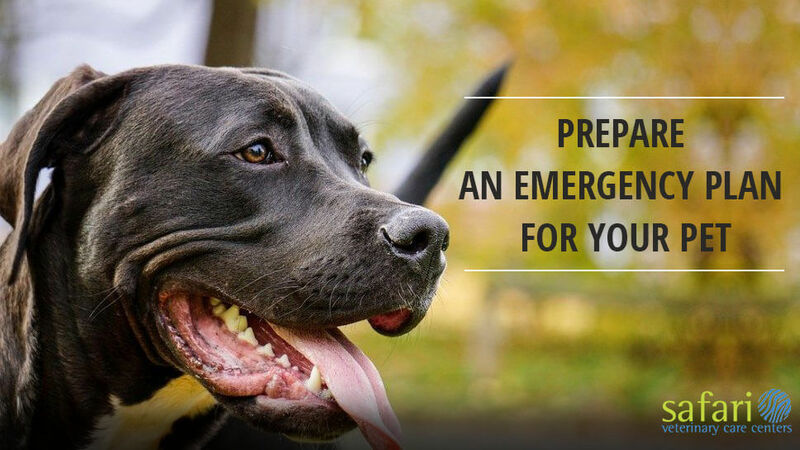 In this post, we have discussed how to prepare an emergency plan for your pet. As a caring pet owner, you have to be ready for such unforeseen circumstances. Whether human-made or a force of nature, below are ways you can prepare an emergency plan for your pet with or without an emergency veterinarian. 1.) Prepare and store emergency survival kits where it can be easily reached in case of an emergency. Preparation is the key in every life situation and emergencies are no different. To be ready for an emergency, prepare several survival kits for your pet and family too. An ideal survival kit should contain necessary survival items like processed food, water, medicine, first aid items, ID cards, a leash, pet tags, medical records, pet toys and even a photo with your pet. You have to be ready for anything that comes up. Emergencies can make you feel harried, rushed and apprehensive so you need to have everything collected, arranged and stored ready. In addition, you can plan with the help of an emergency animal clinic near you. With a survival kit by your side during an emergency, half the battle can be considered won. Emergency situations that require leaving your home or environment demand that you know exactly where next you are going to. To make this easier for you, it is best to create a get-away plan long before anything happens. Consider arrangements with family, friends or acquaintances living away from where the incident occurred. Your exit plan should include how to get away from your affected location and get to a safe, more convenient place. For best results, your League City veterinarian might be able to help with suggestions and how to pick the most feasible options. You wouldn’t want to find out at the last minute that your only option is no longer available or possible. Incidents might happen even when you are unavailable; that’s how unexpected emergency situations can be most times. You can arrange a sort of partnership with your social network – friends, family, and neighbors- on how to treat or evacuate your pet when an emergency occurs. It could be a mutual arrangement where you have to do the same for them and vice versa. Alternatively, you can set up an arrangement with a professional low-cost veterinary clinic to provide support whether you are there or not. Specific meet-up locations could also be agreed on where everyone could meet up when such unsavory events occur. Your arrangement should include showing the parties involved where the necessary survival kits and resources are if needed. Your pet’s veterinarian is your number one partner when setting up an emergency plan for your pet. As experts, they are in the best position to care for your pet after you especially when it needs emergency vet attention. Discuss the possibilities with them, follow instructions, get the necessary resources and play your role well. You may also need to provide them with all the information about your pet to aid their service delivery. On your part, you can keep several contact information of affordable pet clinic in Houston so as to have options to choose from in the case of emergency vet care. The more, the merrier as they say! This step ties into the one above. You need to have a list of the contact information of animal control boards and agencies. In a situation where you lose your pet and can’t find it, these are some of the places to check. One copy of this information could be kept inside the survival kit while another copy could be kept in an easily accessible place – maybe your phone, PC, or even wallet. Emergency pet care is best delivered when planned long ahead of time. You will be more composed, ready and organized to do what needs to be done when you prepare beforehand. Are you a caring Houston pet owner? Having an emergency pet plan remains one of the best ways to increase your pet’s chances of safety when unexpected events occur. To get the best emergency pet care services in Houston, contact Safari Veterinary Care Centers Today!